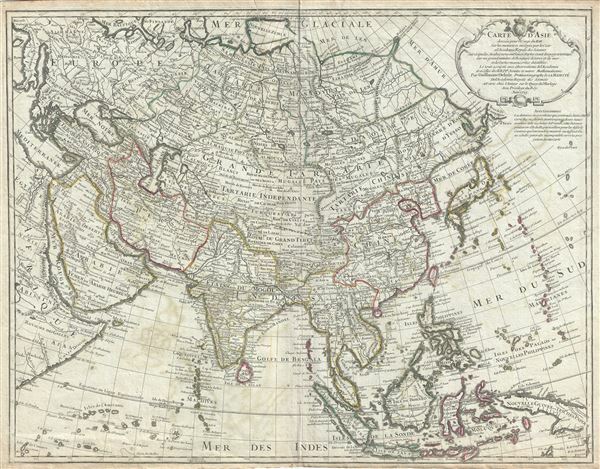 A rare and attractive 1723 map of Asia by Guillaume Delisle. Centered on Independent Tartary, this map covers the entire continent from Africa and the Mediterranean east to the Bering Sea and south as far as Java and New Guinea. The map renders the entire region in extraordinary detail offering both topographical and political information with forests and mountains beautifully rendered in profile. Delisle's presentation is most interesting in its rendering of the largely unexplored extreme northeast of Asia. Knowledge of this area was, at the time, speculative at best. Hokkaido, or as it is mapped here, Eso or Yesso, is joined to Sakhalin and is connected to the mainland of Asia, reflecting a common misunderstanding about this region that persisted until the late 18th century. Just to the east of Yesso (Hokkaido), De L'isle maps the apocryphal Terre de Gama or Terre de la Company. Often called de Gamma Land or Gama, these islands were supposedly discovered in the 17th century by a mysterious Spanish navigator known as Jean de Gama. Various subsequent navigators claim to have seen this land, including Maerten de Vries and Cornelis Jansz Coen, but it was left to Bering to finally debunk the myth. In 1729, he sailed for three days looking for Juan de Gama land but never found it. Thought it may be little more than a mis-mapping of Hokkaido or the Japanese Kuriles, Gama or Compagnie remained on maps for about 50 years following Bering's voyages until the explorations of Cook confirmed the Bering findings. Korea or Corea is present, if misshapen, in roughly the correct location. The sea between Japan and Korea, whose name, the 'Sea of Korea,' 'East Sea,' or the 'Sea of Japan,' is here identified in favor of Korea (Mer de Coree). Historically, Korea has used the term 'East Sea' since 59 B.C., and many books published before the Japanese annexed Korea make references to the 'East Sea' or 'Sea of Korea.' Over time, neighboring and western countries have identified Korea's East Sea using various different terms. The St. Petersburg Academy of Sciences referred to the East Sea as 'Koreiskoe Mope' or 'Sea of Korea' in their 1745 map of Asia. Other seventeenth and 18th century Russian maps alternate between 'Sea of Korea' and 'Eastern Ocean.' The 18th century Russian and French explorers Adam Johan von Krusenstern and La Perouse called it the 'Sea of Japan,' a term that became popular worldwide. Nonetheless, the last official map published by the Russians name the East Sea the 'Sea of Korea.' The name is currently still a matter of historical and political dispute between the countries. This map enjoyed a long print run with many editions being issued by De L'isle, Buache and their heirs. This map was created by Guillaume Delisle in 1723. Very good. Minor wear along original centerfold. Narrow bottom margin. Some offsetting. Original platemark visible.